Devo ser franco: Eu considerava a Datazen a melhor empresa de Front-End para soluções de Business Intelligence e apesar da parceria que a Microsoft tinha com eles, eu ainda me questionava o quão perto o recém-chegado Power BI Preview (Que é o front-end Microsoft de BI na núvem, ainda a ser lançado no Brasil) estava a altura do Datazen. Pois bem, para minha imensa Felicidade!!! E repito… Felicidade! — Porque é esta vibração que estou sentido agora –a Microsoft acaba de anunciar a compra desta empresa!! Nossos clientes SQL 2008 para cima poderão baixar o Datazen Server sem custo e começar a usar!! Só resta saber como o Power BI Preview ainda no forno, será integrado, uma vez que o Datazen era praticamente um concorrente deste produto (em certa vertente). Amazing!! Isto é ótimo para os profissionais de BI que trabalham com plataforma Microsoft, ganhamos ainda mais valor, além, é claro, para todos os clientes!!! Today I am excited to announce the acquisition of Datazen Software, an industry leader in mobile business intelligence and data visualization on Windows, iOS and Android devices. This acquisition accelerates our Power BI strategy to help organizations create a data culture with easy-to-use, accessible tools to extract maximum value from data – from anywhere, on any device. Companies around the world need simpler ways to find data insights they can use to improve their business. With the pervasive use of mobile devices at work, mobile business intelligence (BI) is at a tipping point. Datazen is a mobile-first company at the forefront of this wave, with enterprise customers around the globe using its technology. In particular, SQL Server customers love Datazen, because it is optimized for SQL Server Analysis Services and the overall Microsoft platform, enabling rich, interactive data visualization and KPIs on all major mobile platforms: Windows, iOS and Android. As oftoday, SQL Server Enterprise Edition customers with version 2008 or later and Software Assurance are entitled to download the Datazen Server software at no additional cost. This means millions of people around the world will now be able to visualize and interact with data on their mobile devices, using the native mobile apps available at no charge at the respective app stores. 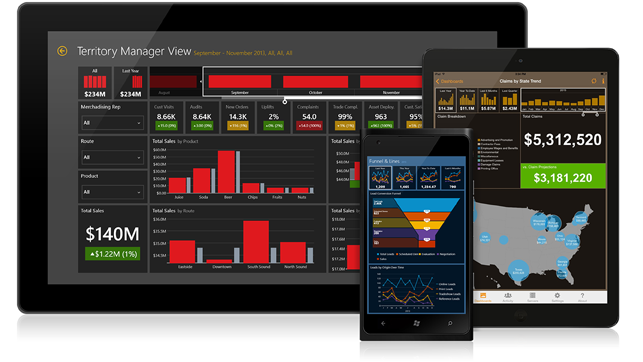 Datazen technology and solutions will complement Power BI, our cloud-based business analytics service, rounding out our mobile capabilities for customers who need a mobile BI solution implemented on-premises and optimized for SQL Server. Over time, we plan to integrate Datazen technology with Power BI to give our customers another hybrid bridge for their on-premises investment to the cloud. Beyond great technology, this acquisition brings a group of talented people to Microsoft. They will help us continue to deliver a broad range of products and services that will empower organizations around the world capitalize on their data opportunities. I’m pleased to welcome them to the team. You can also read a blog post by Miljan Braticevic, CEO of Datazen, here. Esse post foi publicado em BI na Núvem, Geral, Negócios, Power BI. Bookmark o link permanente.